I haven’t written anything on this blog since my last weigh-in. when I started this blog it wasn’t just to report good or bad news on Friday, it was to share my journey and increase my accountability. I have been silent of late, in part because I haven’t been completely happy with my own performance. Today’s post is about being accountable to myself, and with all of you. As you can see, on 4 of the last 5 days I didn’t do any exercising. I could give a litany of excuses about camping, long work days and uncooperative weather. But, they would be just that, excuses. The fact is that I haven’t been as motivated to exercise, and the tally of the minutes shows it. Today I started with 60 minutes in the gym, so I might be back on track. But, we’ll have to see how well I keep it up. 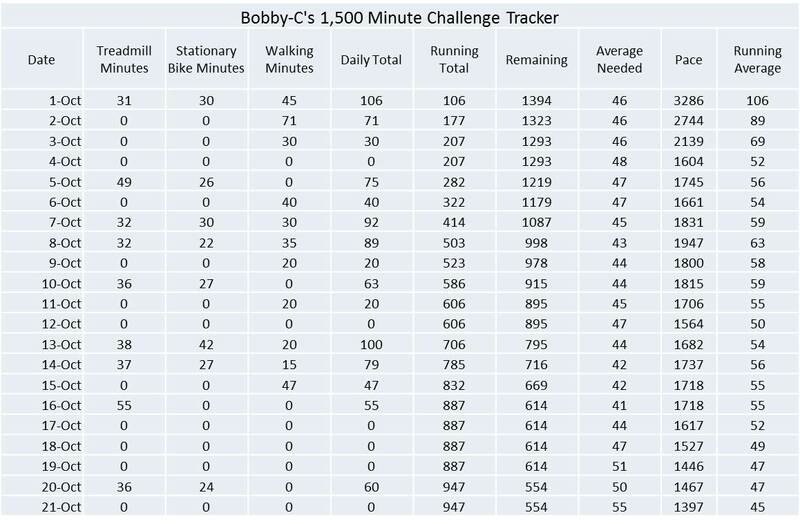 If I average 55 minutes a day for the next 10 days, I will make the 1,500. Last weekend my wife and I went on our final camping trip of the season. We intend to winterize and close our camper this weekend (sad day). The campout was with two other families that are close friends of ours. We had a great time. As usual, the food was amazing as all 3 families stepped up to some great outdoor dining. And, there were some beers at the campfire. I elected on Friday night to not count Weight Watchers points for the weekend. I decided to just enjoy this last trip with close friends and my wife. The trip was fantastic, and provided memories that will last a long time. I didn’t really go overboard on eating, but the beers add up. I have no regrets about the weekend, or for that matter my workout performance. I own all the decisions I have made in the last week. I know that for this journey to be successful, it has to be a lifelong pursuit. It can’t be just about one day, one week, or one month. I made the decision to relax and enjoy the weekend, and I have made the choices to come home after work this past week and unwind. The scale is hidden away until Friday. Whatever are the results on that day – up or down – I will own. If I am up, I’ll be disappointed, but I won’t have regrets about my choices. And, I will just double down the effort for the week ahead.